Apollo 8, the first manned mission to the Moon, entered lunar orbit on Christmas Eve, December 24, 1968. From orbit, the astronauts transmitted the first pictures of the Earth rising over the lunar landscape. 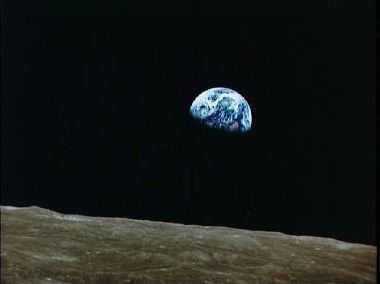 These lovely "Earthrise" pictures have forever changed the way we think of ourselves and our planet. That evening, the astronauts, Commander Frank Borman, Command Module Pilot Jim Lovell, and Lunar Module Pilot William Anders, did a live television broadcast from the Moon. Lovell said, "The vast loneliness is awe-inspiring and it makes you realize just what you have back there on Earth." They ended the broadcast with the crew taking turns reading from the book of Genesis. Borman then added, "And from the crew of Apollo 8, we close with good night, good luck, a Merry Christmas, and God bless all of you - all of you on the good Earth." Two weeks later, we invented the Internet. As Star Trek's Vulcan philosophy says, "Infinite Diversity in Infinite Combinations." The more each individual adds to the Web the more we can all realize its full potential as well as our own. Welcome to the community of cooperation that is the Web not only as a surfer but as an author! Hey! Thanks for visiting. I hope you found it useful and I hope that it helps you take the plunge into making your own Web site and joining the happy band of creators on the Web.